Barrydale Hand Weavers is a skills and job creation project. We train local people in the art of handweaving on looms and produce beautiful handwoven rugs, carpets, tableware, fabrics and even clothing. The weavery is open to the public. People can visit us and see the looms in action, hear the stories of how it all happens and admire the range of pure cotton, handwoven home décor. 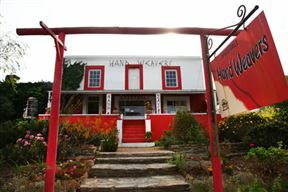 Barrydale Handweavers is 0.7km from the centre of Barrydale , the nearest airport 184.4km (George Airport).